DAVIE, Fla. (AP) — Kenyan Drake began practice Thursday in the corner of the field with several teammates working on his blocking, with no ball involved. For Drake, it was similar to a game. 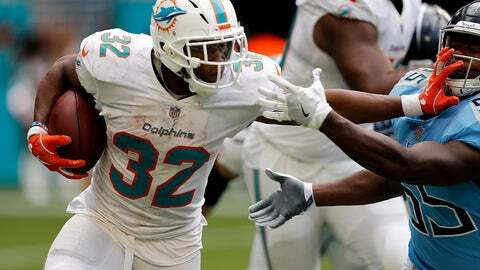 The Miami Dolphins‘ starting running back is averaging less than 11 touches a game and has totaled 107 yards rushing in the season’s first month. The lack of productivity is one reason the Dolphins (3-1) rank 30th in total yards and are tied for 25th in rushing yards heading into Sunday’s game at Cincinnati (3-1). “We’d love to be able to run the ball a little better,” coach Adam Gase said. There are multiple reasons Drake hasn’t had a bigger role. Run blocking has been shaky by a line that has lost two starters — guard Josh Sitton and center Daniel Kilgore — to season-ending injuries. Miami’s run defense and third-down offense have also struggled, and as a result opponents enjoy an eight-minute per-game edge in time of possession. Gase said the primary reason for Drake’s modest statistics is that the Dolphins are averaging 50 plays per game, third-lowest in the NFL. But Drake has fewer carries than his backup, 35-year-old Frank Gore. And the lack of steady work has hurt Drake’s efficiency. Last year he ranked sixth in the NFL with an average of 4.8 yards per carry, topping 100 yards in consecutive games after he became the starter in Week 13. This year he’s averaging 3.2 yards. In his first two seasons with Miami, Drake had touchdowns of 96, 66, 45 and 42 yards. His longest gain this year is 20. Drake and Gore would both like to be busier. A better ground game would mean more ball control, which would help a defense gouged for 38 points in last week’s loss at New England. A more potent rushing attack would also ease the pressure on quarterback Ryan Tannehill, who took a beating against the Patriots. Last year the Dolphins went 1-8 when they rushed for less than 100 yards, and 5-2 when they reached that threshold. It seems the path to improvement is clear, and that means more touches for Drake.